These dark streaks seen on Mars, called recurring slope lineae, are inferred to have been formed by flowing liquid water. 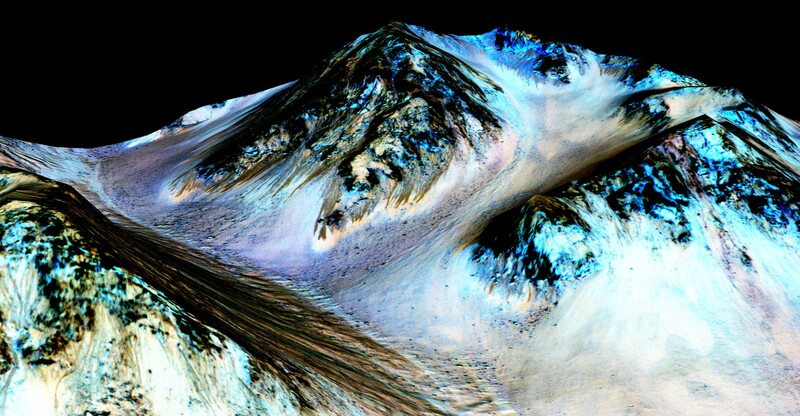 Recently, by using an imaging spectrometer on NASA’s Mars Reconnaissance Orbiter (MRO), scientists have detected signatures of hydrated salts on slopes where the mysterious streaks are seen. These streaks appear to flow over time; flowing down slopes during warm seasons and fading in colder seasons. The findings of hydrated salts hints the idea that the freezing point of a liquid brine is lower, making it possible for shallow subsurface flow.